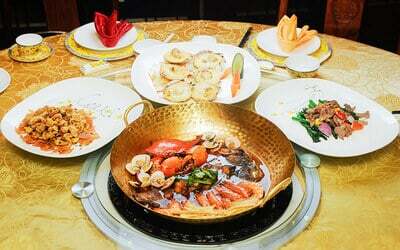 Taste the brilliance of Cantonese cooking which encompasses a variety of fine dishes at the Shun De Palace restaurant. Indulge in this RM100 cash voucher and satisfy your cravings for some delectable orient dishes such as claypot braised bean curd, pan fried pork tail, roast duck, and many others with your friends or family! Valid Monday - Sunday: 11:30am - 2:30pm, 6pm - 10:30pm. Valid on public holidays. Not valid with other special price dishes / offers / promotions / discounts.